If you’re not careful, you’ll live your entire life on Facebook. Instead of posting about going to the zoo, you just share images you found on the zoo’s FB page. Instead of having a meaningful night with your lover, you guys tag and poke each other all night long. Instead of posting pics of your dinner, you become more machine than human and no longer need a computer or smartphone to post status updates. Stop using Facebook all the time before it’s too late. 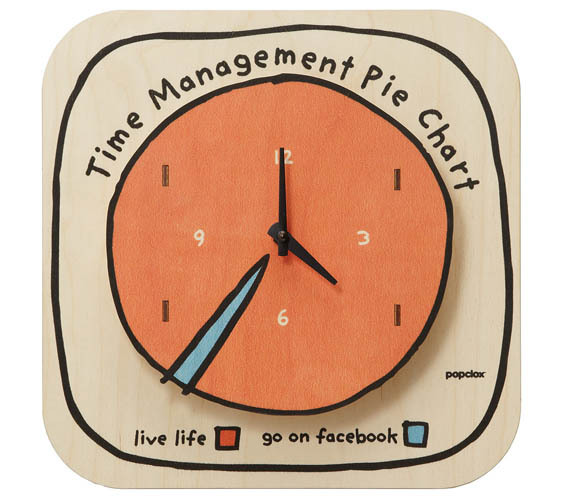 The Time Management Pie Chart Clock will remind you to stop Facebooking long enough to go out and live life. Your Facebook friends will thank you because by actually living life you might start to have interesting things to say in your status updates.